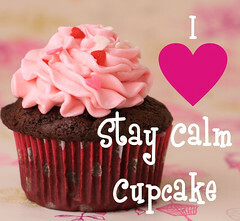 tie-dye cupcakes | Stay Calm, Have A Cupcake! What is more fun than Tie-Die?! Well, Tie-Die Cupcakes, of course! These colorful cupcakes are the perfect addition to any birthday party. With a simple vanilla base, the recipe is quick and virtually impossible to mess up. Get creative with your own color combinations and make your next party funky fresh! Here’s the recipe – Enjoy! Add in the milk and whisk to combine. Add water, vanilla, butter, and eggs. Combine with an electric mixer then beat two more minutes. Bake at 350 for 12-15 Minutes. In an electric mixer cream the butter until light and fluffy. I usually beat on medium speed for 3-4 minutes. Separate the frosting into 3 small bowls. Using food coloring, color each bowl a different color. Cut the tip off your piping bag, insert the piping tip. Use a medium size cup and fold the piping bag over the edges – this makes it easier to fill the piping bag with frosting. Using a spoon or spatula, put one of the colored frostings into the piping bag. Alternate colors until your piping bag is filled with multi-colored frosting. Pipe frosting onto each cupcake. Add sprinkles if you desire. There you have it! Let me now f you have any questions. Until next time, Stay Sweet!